'Sterling Mistress' (Sterling Innerst, R. 1987). Seedling# 2384-11. TB, 34" (86 cm), Midseason to late bloom. Standards light pink; falls white, trimmed pink; pink beard. 'Mistress' X 'Morning Sunshine'. Innerst 1988. From AIS Bulletin #269 April 1988 Introducing STERLING MISTRESS---Sdlg. 2384-11. TB, 36". White trimmed pink plicata. The pinkest we've seen. 9-10 buds. Weed like vigor! Wonderful branching. Light harmonious orange beards. Fertile both ways. Mistress X Morning Sunshine. $25.00. Sterling Innerst. 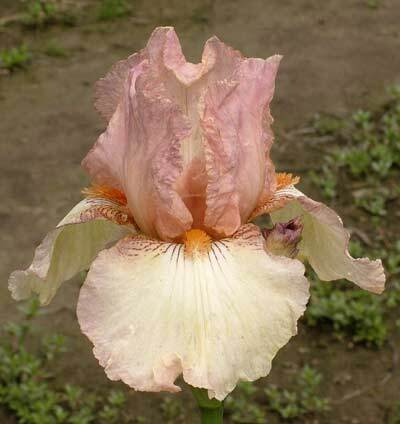 JPG STERLINGMISTRESS1.JPG manage 162 K 25 Nov 2018 - 03:30 Main.TLaurin Photo by Debbie Carpenter-Iris Splendor Garden-Australia. JPG SterlingMistressSI.JPG manage 242 K 17 Apr 2019 - 03:08 Main.TLaurin Photo by Sandy Ives.